There are developed high nitrogen steels: stainless, structure, heat resistant of mechanical and operational properties exceeding up to 200% those of the nitrogen free analogues. Technologies and installations are developed, including laboratory and semi-industrial, for investigation and production of high nitrogen steels and alloys. 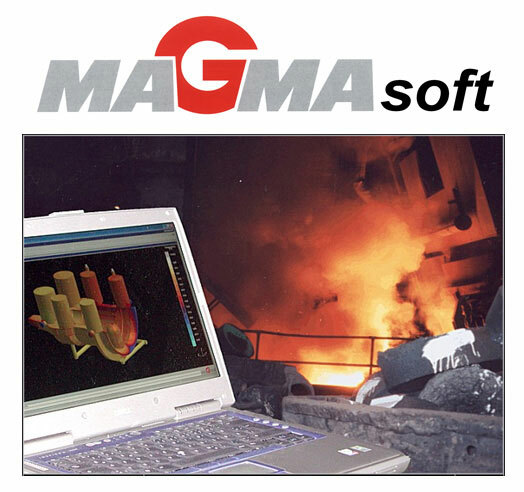 MAGMASOFT is a modern and powerful program package for simulation and optimization of casting technologies. The penetration of the computer software in the world casting practice is long ago not an extravagant decoration for efficient presentation of the products but has become an integral part of the research and R&D activities, related to exactness and optimization of the casting technologies, development of castings of high exploitation qualities, lower metal consumption, energy savings, sharp decrease of the time for the design-realization cycle, fast and accurate, qualitative and quantitative diagnostics of wide range of eventual defects. One of the most used software packages for such purposes is known under the name MAGMASOFT. It is developed by MAGMA GmbH company with head quarters in Aachen, Germany. The package is being developed and extended continuously by the company employees. There are extended and improved both the mathematical models, covering wider and wider circle of phenomena and processes, and the data base, which allows treatment of wider and wide circle of materials and alloys as well as the casting methods. Thus the package successfully competes with the most famous and powerful programs in the branch, such as Abbacus, РгoCast, AnyCasting, NOVACAST, 3D-FLOW, etc. Filling of the gating system and mold by melt under conditions maximum close to the real. MAGMAsoft offers special tool called “Tracer”, which visualizes the trajectories of the fluid individual particles, when the flow characteristics are clearly delineated, turbulences emerge and the risky spots of eventual defects during filling are traced out. Formation of porosity and shrinkages in the casting. Thermal and concentration convection in the melt as well as diffusion of the melt components in liquid and solid states. On this base MAGMAsoft predicts the macro-segregation in the casting and distribution of the individual components concentration. On the base of specialized criterial functions the casting structure is predicted in each of its local areas. The product geometric modeler possesses a large specter of various geometric figures and wide range of operations over them such as translations, rotations, scaling, etc., which permit quick and precise building of objects and systems of most sophisticated geometry. At the same time visualization of the system of bodies is performed simultaneously in three different orthogonal projections and in perspective. The program calculates the stresses, strains and shifts of the casting and mold during crystallization localizing the high risk zones for hot or cold cracks. Special “Erosion Criteria” traces the fracture risk of the mold working surface during filling. Feeding effectiveness. Criterion which shows what part of the molten metal, necessary to compensate the volume shrinkage, succeeds to arrive through the dendrite network to the crystallization front.